According to every one of the newer WCAG criteria, this passes. According to the older test used for the "Are colours compliant?" box, however, it fails. Reading the background text and linked documents, it sounds to me like the WCAG criteria should take precedent over the other test: WCAG is newer and is specific to text readability, while the older test appears to be described as "a suggested algorithm that is still open to change" and is not specific to text. Is this a sound interpretation? 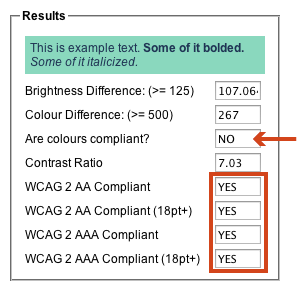 Can a colour contrast that passes the appropriate WCAG test but fails the other test be considered compliant despite the "Are colours compliant? NO" message, because it passes newer, more appropriate tests? Or are there factors important to text readability that are taken into account in the earlier test that are not covered by the WCAG test? Technique 2.2.1 is only a suggestion. As you point out, Technique 2.2.1 is “open to change.” It’s listed in a 14-year-old working draft that apparently hasn’t gone anywhere, and for good reason, as the remaining points will illustrate. Technique 2.2.1 doesn’t actually provide recommendations. Technique 2.2.1 says, “The rage [sic] for color brightness difference is 125. The range for color difference is 500.” Some have interpreted this to mean the brightness difference should be at least 125 and the color difference should be at least 500, but that’s not what it says. Instead, it sounds to me more like a botched attempt to describe the possible range of values (the actual range for brightness is 255 and 765 for color). If those values are intended to be recommended limits for designers to follow, I don’t see what they’re based on. They seem to be numbers pulled out of the air. In contrast, the recommended limits of Guideline 1.4.3 are consistent with other recommendations I’ve seen (e.g., the FAA Human Factors Design Guide(pdf), Section 8.2.4.1.20). The algorithms in Technique 2.2.1 are naïve. The algorithms in Technique 2.2.1 lack sophistication, relying on simple linear equations. This ignores the fact that perceived brightness and color contrast is nonlinearly related to subpixel values. Guideline 1.4.3 includes nonlinearities (e.g., gamma). To calculate perceive color differences while accounting for nonlinearities, the CIE Luv model is more accurate. It has been around for decades. For readability brightness contrast matters. Technique 2.2.1 includes an algorithm for total color (hue and/or brightness) contrast, while Guideline 1.4.3 only looks at brightness contrast. For accessibility purposes (including making text readable for users with color vision deficiencies), readability depends on light-to-dark contrast not raw color contrast, because the whole point is you can’t count on users having color vision. Actually, for users with typical color vision, brightness contrast matters more than hue contrast. Try reading FF0000 text on a background of 007AFF. They have radically different hues but equal brightness (1.0 contrast using the algorithm in Guideline 1.4.3). Technique 2.2.1 indicates the color difference of 632, yet it hurts to try to read it. Compare that to 404040 on C0C0C0. They’ve the same hue (none) but different brightness (a healthy 6.0 using the algorithm in Guideline 1.4.3). Readability is a lot better than the prior example even though Technique 2.2.1 says it has a lower color contrast of 384. Technique 2.2.1 should be ignored. It’s old, it’s not an official recommendation, it has no apparent citation or basis, and it seems to reflect a poor grasp of established knowledge of perceived color contrast and readability. Likewise, the outputs of on-line tools like snook.ca that use the algorithm and alleged recommended limits in Technique 2.2.1 should not be used. Not the answer you're looking for? Browse other questions tagged accessibility readability color-scheme or ask your own question. How to test for the best colour of an online store?